Also known as the "Dymaxion Map," the Fuller Projection Map is the only flat map of the entire surface of the Earth which reveals our planet as one island in one ocean, without any visually obvious distortion of the relative shapes and sizes of the land areas, and without splitting any continents. Fuller's map has since inspired the award-winning AuthaGraph World Map, created by Japanese architect and artist Hajime Narukawa. 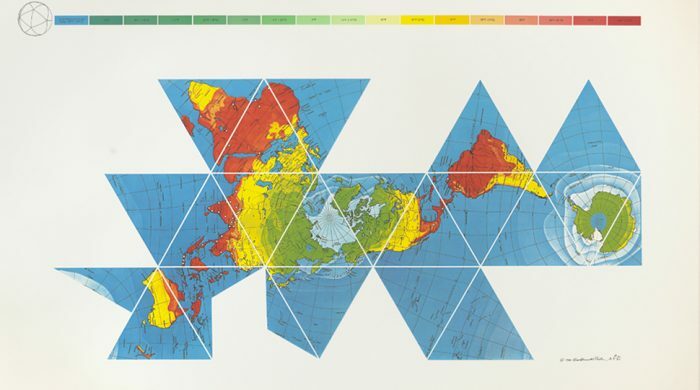 And it led robotics engineer Gavin Smith to fashion The Dymaxion Globe, essentially by dividing the Dymaxion Map into triangles and and folding them into a three-dimensional figure. Smith explains the process of making a Dymaxion Globe over at Make Magazine. But above, you can watch it all happen in a video produced by Adam Savage's Tested YouTube channel. They walk you through the creation of a laser-cut Dymaxion Globe. Enjoy.